I have a MacBook Intel Core 2 Duo running at 2.0GHz. I’d like to upgrade it to hold 4GB of memory but I’m not sure if it will hold that much. Some websites say that it will hold just 2GB, yet Apple’s website says it will hold 4GB. Which is true? It depends on which MacBook you have. Apple issued several 2.0GHz MacBooks with Intel Core 2 Duo processors. Some support just 2GB of RAM and others, 4GB. 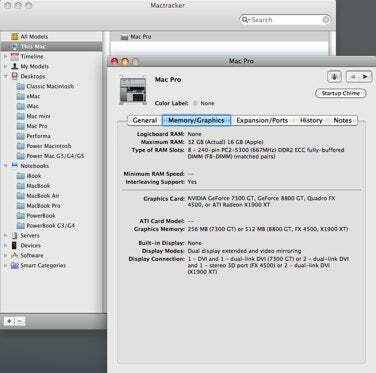 Allow me to suggest that you download a copy of Ian Page’s free Mactracker to help you identify which MacBook you have. It couldn’t be much easier to use. Just launch it on your MacBook, select the This Mac entry in the list of Mac models, and double-click on the name of your MacBook on the right side of the window. Click the Memory/Graphics tab in the window that appears and look at the Maximum RAM entry. Here you’ll learn how much RAM your MacBook can handle.